This week’s snippet is from my short story collection, The Futility of Loving a Soldier, which has a print edition coming out later this month. Today’s excerpt is from “Gone But Not Forgotten.” Carolyn is going through boxes belonging to her ex-husband when she finds a medal that triggers some memories of when she went out for the afternoon, leaving her husband to watch their baby. She arrived home and no one was there. Her neighbor Meredith exchanged a look with her husband, Jim; They were military too and probably trying not to reach the same conclusions as Carolyn. Other neighbors popped out of their houses, and Jim organized them into pairs. They fanned out on foot through the neighboring streets, or jumped in vehicles to search farther spots. Carolyn’s mom arrived, coaxed her daughter into the house, and made her drink some tea she’d probably laced with Valium too because the next few hours were a fog. It was dark when the police called to say they’d found the baby, and Bryce too, but Carolyn barely heard that part. All that mattered was that they’d found her baby and that her baby was safe. 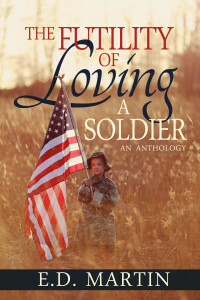 Read more about Carolyn and Bryce in The Futility of Loving a Soldier, then post a link to your eight sentences blog entry, or join the fun at the Weekend Writing Warriors website.